A major spill of hydrochloric acid is an emergency. Evacuate the area and call 911 immediately. Minor spills can be cleaned up with appropriate precautions. Hydrochloric acid, also called muriatic acid, is often used to clean metals or in pool maintenance. Use extreme care in handling this extremely corrosive, poisonous acid, which can cause severe damage to all body tissues. If a small amount of the acid is spilled, it should immediately be cleaned up to prevent harm to anyone or damage to whatever it was spilled on. When using hydrochloric acid, always wear protective clothing and gear, such as eye goggles and gloves. 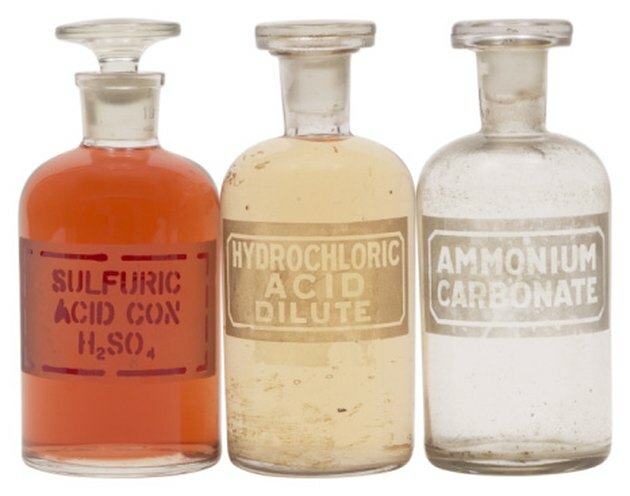 Take great care when you handle hydrochloric acid. Set up an absorbent barrier around the minor hydrochloric acid spill to prevent the acid from spreading. Absorbent materials that can be rolled to create a barrier include such items as rags, towels, or socks. Neutralize the spill. Garden lime or crushed limestone are excellent for the purpose, or use other carbonate materials such as carbonate granules or bicarbonate salts. Not only does the carbonate material neutralize the acid in sufficient quantity, it also helps to absorb the liquid. If carbonates or bicarbonates are not immediately available in the case of minor spills, use cat litter or talc to help absorb the liquid. Allow the neutralizing agent to sit on the spill for 8 hours. After 8 hours, use a broom and a plastic dust pan to sweep up and absorb the neutralizer. Sprinkle the area again, until all the acid is absorbed. How Do I Clean Up or Neutralize Phosphoric Acid?